Fiasco: the American military adventure in Iraq, by Thomas E. Ricks, hardback, 482 pages, ISBN-10: 0-713-99953-5, Allen Lane, an imprint of Penguin Books, 2006, £25. This is one of the best books on the war against Iraq. Thomas Ricks, the Washington Post's senior Pentagon correspondent, argues that the invasion has been the worst US foreign policy decision ever. With 655,000 Iraqis killed, more than 2,810 US troops dead and more than 21,600 seriously wounded, the occupation of Iraq is a disaster. The 9/11 Commission concluded unanimously that there was no evidence that Iraq and al-Qaeda ever had "a collaborative operational relationship" and no evidence that Iraq had ever been involved in any attack on the US. The US's leaders presented their wishful thinking as fact – about Iraq's nonexistent al-Qaeda links and about the nonexistent weapons of mass destruction in Iraq. So the US's rulers should have had just one target – those who carried out the 9/11 attack. Instead, they attacked three – al-Qaeda, Afghanistan's Taliban, and Iraq. A textbook example of how to create an insurgency: the US/British debacle in Iraq. A study by Jeffrey Record, published by the War College's Strategic Studies Institute, said, "Of particular concern has been the conflation of al Qaeda and Saddam Hussein's Iraq as a single, undifferentiated terrorist threat. This was a strategic error of the first order because it ignored crucial differences between the two in character, threat level, and susceptibility to US deterrence and military action. "The result has been an unnecessary preventive war of choice against a deterred Iraq that has created a new front in the Middle East for Islamic terrorism and diverted attention and resources away from securing the American homeland against further assault by an undeterrable al Qaeda. The war against Iraq was not integral to the GWOT [Global War on Terrorism] but rather a detour from it." Ricks also observes that the US's rulers understated the difficulty of remaking Iraq. Paul Wolfowitz, one of the war's architects, characteristically said in December 2002, "people are overly pessimistic about the aftermath." He also said, "I don't see why it would take more troops to occupy the country than to take down the regime." He claimed the US force would need to be only 30,000 by August 2003, and that Iraq's oil would pay for occupying and rebuilding Iraq. In the real world, the US now has more than 150,000 troops there and the war has cost the US more than $300 billion. In a textbook example of how to create an insurgency, the US occupation authority destroyed Iraq's administrative structure, army, police and industries. Oil production is half pre-war levels. A member of the Coalition Provisional Authority described it as "pasting feathers together, hoping for a duck". A four-star general said that it was almost as if the US was working "to create the maximum amount of chaos possible". The occupation forces' presence and actions feed the fires. The US and British states are using 60,000 mercenaries, who are unregulated and unaccountable. There are almost 21,000 British 'private security guards' in Iraq, three times the number of British troops. The US state institutionalised abuse: its military intelligence ordered, "we want these individuals broken". In the first 18 months of the occupation, 40,000 Iraqis suffered detention in US-run prisons. 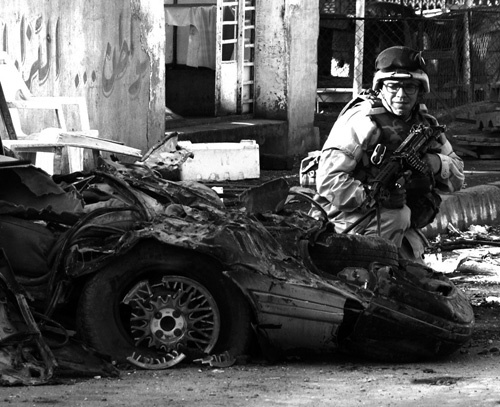 There were 34,131 insurgent attacks in 2005, up from 26,496 in 2004. The rulers' cheerleaders now lie that "We all got it wrong." No, the US and British ruling classes got it wrong; the working classes of the world got it right, opposing the war from the start, by huge majorities.